Sreepadraj Venkatarao is the founder of the Law Firm located which is located in the suburbs of Philadelphia, Pennsylvania. He is licensed to practice United States Immigration Law in all the fifty states and worldwide. He has a decade of relevant professional experience and a strong educational background. The Attorney's legal experience includes working as an Extern at the United States District Court, District of Delaware. While working at the Federal Court he conducted legal research, attended trial related conferences, reviewed legal briefs & motions and drafted rulings. He is also a Registered Patent Attorney and has plans to expand into this area of law. 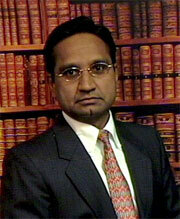 Attorney Sreepadraj Venkatarao has an extensive educational background. He obtained his Juris Doctor degree from Widener University School of Law and has been licensed to practice law for the past four years. While in law school he was awarded a scholarship in recognition of his outstanding academic achievement during first year of law school. During his legal studies, he was also placed on the Deans Honors List in recognition of his academic performance during the third semester. He also has a Master's Degree from New Jersey Institute of Technology and Bachelor's Degree in Mechanical Engineering from Bangalore University. While studying for his Bachelor's Degree at Bangalore University, he was awarded full tuition waiver in recognition of his excellent academic performance in the first two semesters of school. He graduated from Bangalore University with "First Class with Distinction" in six of his semesters. The Attorney approaches practicing Immigration Law with a unique perspective, for he has personally experienced the complex process of emigrating to the United States. The insight so gained, has prepared the Attorney to be able to better understand client's viewpoint, effectively articulate their position to the immigration authorities, and eventually ensure that they achieve their immigration related objectives. Attorney Sreepadraj Venkatarao has also been an active member of several professional organizations like the American Immigration Lawyers Association, American Intellectual Property Law Association and the American Bar Association. While at American Intellectual Property Law Association, he has served on their International Education Committee He was also a member of the Executive Committee of the Indian American Association of Lehigh Valley. The Attorney routinely volunteers at citizenship day events organized by the American Immigration Lawyers Association. He has volunteered his services at multiple events organized by the Wills for Heroes Foundation assisting first responders prepare their wills and other related documents. He has provided comprehensive pro bono assistance to non profits like ethnic Indian Temples and social service organizations like Service and Education for Women against Abuse (SEWA). He has also offered his services to international non profit organizations like Public Interest Intellectual Property Advisors.